It's Turkey... or Thanksgiving as others call it, and the entire city of Prontera is filled with a festive atmosphere. 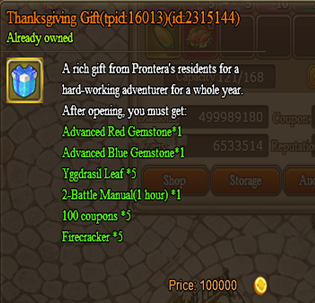 On Thanksgiving Day, the residents of Prontera have prepared some amazing gifts for adventurers. The residents of Prontera have prepared special gifts for adventureers to thank you all for everything you do for Prontera. Head to Prontera and talk to Uncle Modi (74,73) to collect it! Every year, Thanksgiving is the perfect time to enjoy some corn. 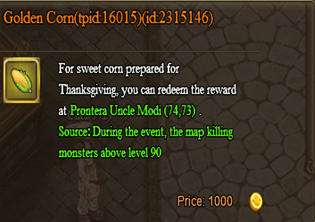 On maps level 50 and above, Daguai will have a chance to drop the event item "Corn. 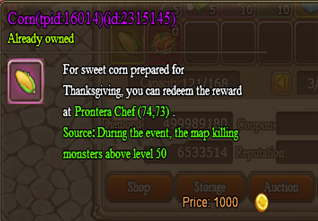 Even better, all maps above level 90 have the chance to drop the event item "Golden Corn." Adventurers can bring these items to Prontera Uncle Modi & Chef (74,73) for even more rewards! PREV: Jump into Open Beta Events!